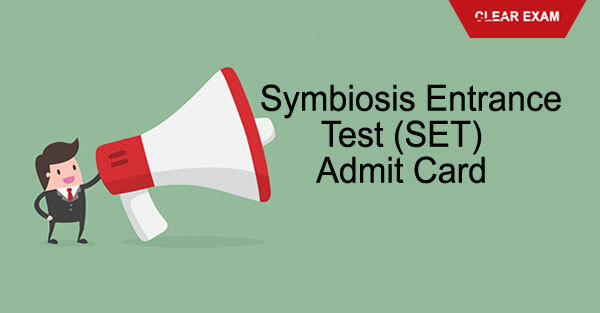 SET Admit Card has been released by the Symbiosis University. SET Admit Card can be downloaded by applicants from the official website. Those who have submitted the online SET Application Form can download the SET Admit Card 2018 as per the schedule. To download the hall ticket for the SET exam, the candidate will need to log in using SET User ID, and password. Information is given here for candidates to know about how to download SET Admit Card and other instructions. Candidates must carry the admit card of SET 2018 along with a photo ID proof on the day o the exam. They will not be allowed to appear for the test without the admit card. To obtain the SET 2018 Admit Card, the candidate will have to log in at set-test.org before the examination and print the hall ticket. SET Test Admit Card should be printed from the SET website www.set-test.org which is available as per scheduled date. Bring the admit card and a photo identity to the test centre. It will be authenticated during the Test. Candidates shall preserve the authenticated admit card till the admission processes of the desired Symbiosis institutes are over. If the admit card is lost, no duplicate admit card will be issued. Please ensure that your latest passport size, the coloured photograph is pasted on the Admit Card at the place provided for and duly attested by Gazetted Officer before appearing for the test. An authorized person from Symbiosis International University will verify and authenticate your Admit Card against the photo-id. Please preserve this authenticated Admit Card for further PI-WAT processes. At the time of filling an online application form or while appearing for the SET test, any attempt to impersonate or indulge in any other malpractice would automatically disqualify the candidate from admission processes of all undergraduate institutes of Symbiosis International University and make the student liable to legal prosecution as per the laws of the country. If you have any queries regarding SET 2018 Admit Card, please ask in the comments below. SET Admit Card (Symbiosis Entrance Test) 2018 – Download Here Symbiosis Entrance Test (SET) 2018 Admit Card.